CHRISTUS Hospital-St. Elizabeth and St. Mary is recognized both locally and nationally as the health care leader in Southeast Texas. Our hospital campuses in Beaumont and Port Arthur include outpatient medical facilities, wellness centers, specialty health centers, and medical office buildings. CHRISTUS Hospital is one of the largest facilities in the CHRISTUS Health system, which ranks as one of the top 10 health systems in the country. Distinguished by its high caliber staff and affiliated physicians as well as a comprehensive and innovative scope of services, CHRISTUS Hospital has a long history of responding to the needs of the community. 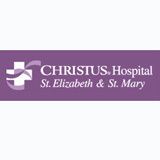 CHRISTUS Hospital-St. Elizabeth and St. Mary, along with our partner-hospital, CHRISTUS Jasper Memorial Hospital, comprise CHRISTUS Health Southeast Texas, a regional component of the CHRISTUS Health system. At CHRISTUS Hospital, we are privileged to work in a Catholic, faith-based ministry with a heritage of healing and care that dates back more than 130 years. Jointly sponsored by the religious congregations of the Sisters of Charity of the Incarnate Word in Houston and San Antonio, our Mission is to extend the healing ministry of Jesus Christ. Our Mission is embraced by the Associates, volunteers, spiritual care providers, and physicians who practice at the St. Elizabeth campus in Beaumont, the St. Mary campus in Port Arthur, and at our regional partner-hospital, CHRISTUS Jasper Memorial Hospital in Jasper. Together we strive to provide you, our patient and our guest, with the advanced medical skill and technology to treat your physical needs, the comfort and empathy to meet your emotional needs, and a compassionate, faith-based environment to fulfill your spiritual needs. CHRISTUS Hospital-St. Elizabeth and St. Mary has won multiple national and local awards honoring it as the best in a variety of healthcare specialties. The true winners of these awards are our physicians, Associates, board members and volunteers whose quality patient service and care have contributed to our the national recognition we have received. Learn more about our local, state, and national recognition for quality care and service. To better serve our community, expansions and renovations are underway at both our hospital campuses. They include a dedicated rehabilitation unit at St. Elizabeth, renovations to surgical suites, patient rooms and waiting rooms, Medical Day Spa, Spine and Orthopedic Specialty Center, emergency room expansions, and the Woman's Imaging Center at St. Mary. As part of a Catholic health system, CHRISTUS Hospital is committed to increasing access to health care for the uninsured and underserved through community benefit, advocacy and other initiatives. We are much more than a provider of health services; CHRISTUS Hospital embraces a culture committed to responding to the needs of those we are called to serve, while delivering high quality care that is accessible to all. It is this compassionate and caring environment that drives us to return the optimal value of our charitable assets to our local communities. View the CHRISTUS Health Southeast Texas Community Benefits Report. Welcome to Texas with a little something extra! Where Louisiana Cajun meets Texas cowboy. You'll feel right at home in Beaumont. Home to big cookin', big events and big fun. From bird watching and botanical gardens to swamps and gators, you'll find plenty of things to do inside and outdoors. With classic Cajun cuisine, zesty Texas barbecue and authentic Mexican fare, the restaurants are as spicy as the people who live here. Today, Beaumont is in the midst of another boom. Visit the city and you'll see an old-style Texas town with a modern twist. Beaumont Main Street and the City of Beaumont have teamed up to preserve the historic sites in the area, promote opportunities within the city and encourage job growth.